Craftsmanship and ingenuity shine inside and out on this remodel because what you don’t see is just as amazing as what you do see. The homeowners came to our team wanting to open up their galley kitchen to relate to the living space and new pool view while creating a contemporary aesthetic that would complement their home’s original architectural character. What the Chicago transplants didn’t realize, however, was that their home was wracked with structural issues. All of which needed to be addressed before design work could begin. The home’s foundation was plagued with issues due to the active nature of Texas’ clay soil and the previous homeowner’s neglect to correct the problems. Walls were bowed and excessively out of plumb, corners out of square, and the floors were not level. Due to the owner’s tight budget our team was allowed to address and rectify only the issues that were to be affected by the remodel. After removing all the materials down to the studs, we were able to square the walls by sistering new studs to the existing structure. We leveled the floor beneath where the new cabinetry would be placed and “feathered” in and repaired planks of the original flooring so that when it was meticulously stained and color matched not even the homeowner could tell where the old kitchen layout used to be. Removing the structural wall between the kitchen and living area encompassed two hurdles. The first was transferring the load of the roof and the second was hiding HVAC and electrical runs. To avoid the expensive cost of constructing custom exposed beams or collar ties, a structural column was designed to help bear the load of the gable between the interior and exterior walls. The necessary “post” was anchored in the new island design and camouflaged into a graphic sculpture of stainless steel and mdf panels to make it feel like an integral part of the overall design. Next, to incorporate HVAC and electrical runs in the new space, mechanical ducting and conduit was run between the ceiling joists of the garage below the kitchen. 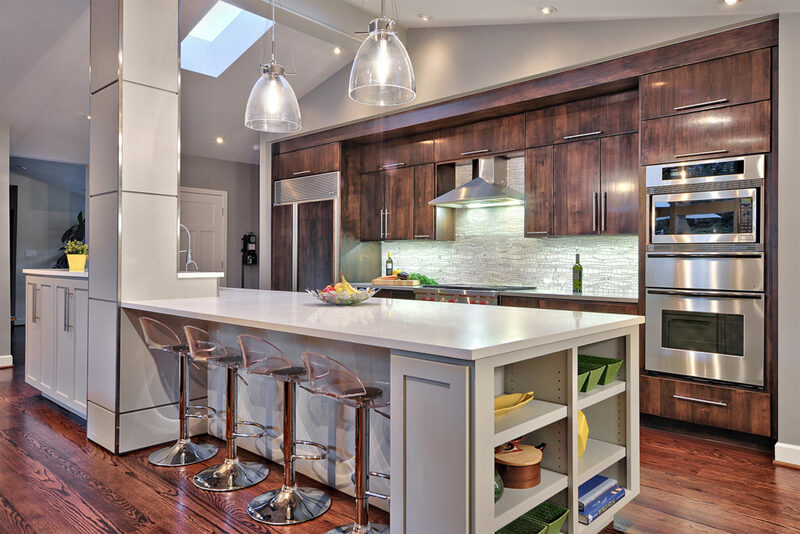 New registers were placed in the toe kicks of the cabinetry and electrical junctions were supplied through the island cabinets and stainless steel backsplash. The existing space was poorly illuminated with only skylights and indirect fluorescent lighting. With the removal of the intermediate wall, natural light would now flood the space from the large patio windows during the day. 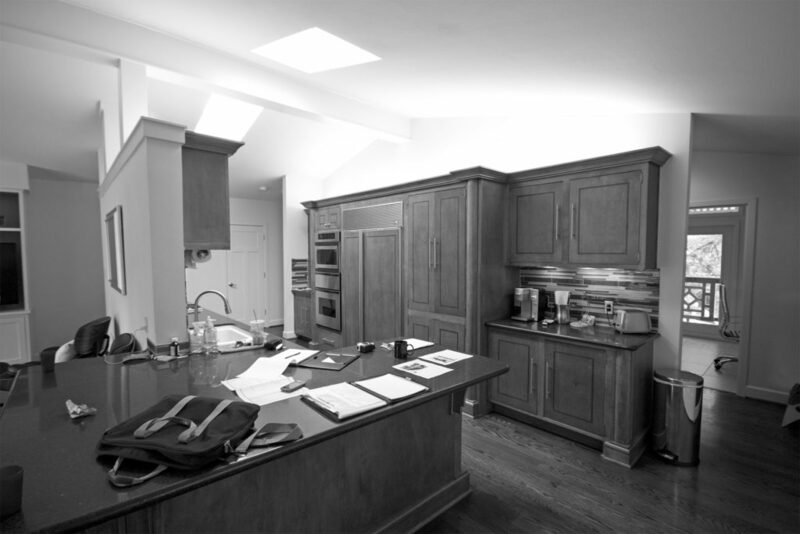 We also installed recessed adjustable ceiling gimbals, under cabinet LED lighting and decorative pendants over the island to provide proper ambient and task lighting for both day and night time utilization. Capitalizing on creative storage was paramount in this remodel considering the lack of walls. 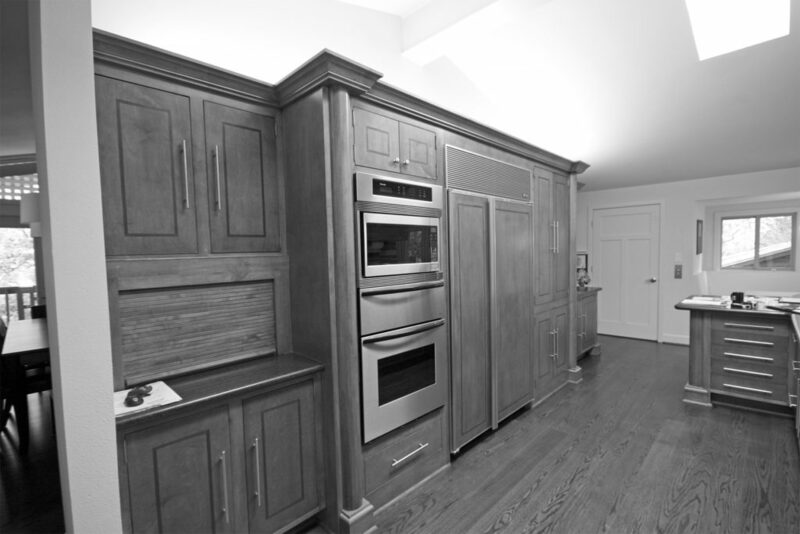 Positioned in the back wall are customized storage pull outs designed with the homeowners’ specific pantry and cooking items in mind. A sleek “flyover” soffit ties together that run of cabinets housing the bulk of the major appliances making access from refrigeration to cooking a succinct transition. The warm gray quartz counters bring out the grays and golds in the sinuous, scale-like Calcutta Gold Marble mosaic tile from Artistic Tile, which is the show piece of the new space. The counters and tile both contrast harmoniously with the sultry, dark stain of the Alder wood custom cabinet slab doors. The real workhorse, however, is the 15′ long, dual level island, which creates the delineation between the cook’s space and the guests’ space. It boasts a Bosch dishwasher, the Kohler “Vault” stainless steel sink, industrial style pull down faucet from Elkay, seating for four and almost 120 cubic feet of customized universally-friendly accessible storage. In contrast to the back wall, the island is designed with shaker style doors in a soft contemporary gray painted finish and is “iced” with crisp white quartz tops. The structural column is trimmed with custom stainless steel square tubing and painted in the same gray color to act as a vertical, extension of the island. 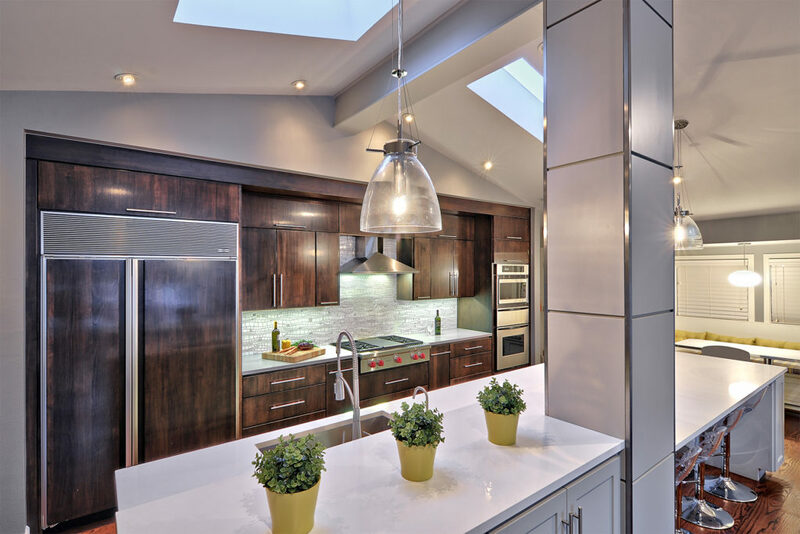 Accentuated with the custom stainless steel backsplash and adorned with 3 stylish glass pendants by Sonneman, this island is the epitome of where form and function coexist in a perfect marriage.